Two weeks ago, The Times of London supplied ISIS with a document titled “Outlook for special neutron-related activities over the next 4 years” which ISIS assessed as a contribution to their reporting. Catherine Philp reported the story on The Times’ web site last night describing this document and its origin and other documents she obtained. The TimesOnline report can be found here. The original document in Farsi and the English translation can be found here. p> If the data in this document are correct and the descriptions of the work are accurate, then this report appears to be describing a plan to further develop and test a critical component of a nuclear weapon, specifically a neutron initiator made out of uranium deuteride (UD3), which when finished (and subsequently manufactured) would most likely be placed at the center of a fission bomb made from weapon-grade uranium. This type of initiator works by the high explosives compressing the nuclear core and the initiator, producing a spurt of neutrons as a result of fusion in D-D reactions. The neutrons flood the core of weapon-grade uranium and initiate the chain reaction. It does not boost the yield. A graphic by the TimesOnline outlining this process can be found here. p> This type of neutron initiator can also be found on the cover of a book by A.Q. Khan published at a time when Khan was denying that Pakistan had a nuclear weapon program (see figure 1). The double message was that Pakistan had mastered this type of complicated neutron initiator. We know now that Pakistan received the design of this initiator from China in the early 1980s and Khan passed it to Libya in the early 2000s. p> Although Iran might claim that this work is for civil purposes, it has no civil application. The neutron group’s document also implies that some of the work on this type of neutron initiator was done in 2003 or before. p> The measurement of the neutrons emitted by this UD3 source would be the hardest measurement Iran would need to make in developing a nuclear weapon. This assumes that Iran believes it cannot do a full-scale nuclear test, although it would be expected to do a “cold test” of the full device as a way to gain confidence the nuclear weapon would perform as expected. (This approach was followed by Pakistan in the early 1980s and Iraq was planning to do so prior to the 1991 Persian Gulf War.) The timing of the explosion and resulting shock waves would need to be perfect in order to get enough fusion to create a spurt of neutrons in a reliable manner at exactly the right instant. The experiment itself is very difficult to do. There are relatively few neutrons emitted in a brief period of time and there is a lot of noise from the electronics that interferes with the neutron measurements. p> The Iranians would need to do accurate calculations about the number of neutrons that would be produced and the time at which they would be produced. These calculations are also difficult and time consuming. p> Some have characterized this document as a smoking gun on Iran’s weaponization activities. It might in fact be that. But ISIS urges caution and further assessment of this document, in particular to confirm the document’s date and with how the document fits with other information regarding Iran’s nuclear weaponization activities both prior to 2003 and any work afterwards. The document could describe work to develop and maintain a capability rather than being part of a program authorized to build nuclear weapons. The document does not mention nuclear weapons and we have seen no evidence of an Iranian decision to build them. On the other hand, doing the kind of work described in this document is a far cry from the common belief that Iran stopped work on nuclear weapons in 2003 and has not restarted such work. Even without a decision to build nuclear weapons, this type of work is consistent with a plan to have all the research and development in place in the process of creating a reliable nuclear warhead for a ballistic missile such as the Shahab 3. Figure 1. An image from the cover of the book Dr. A.Q. Khan on Science and Education, by A.Q. Khan. 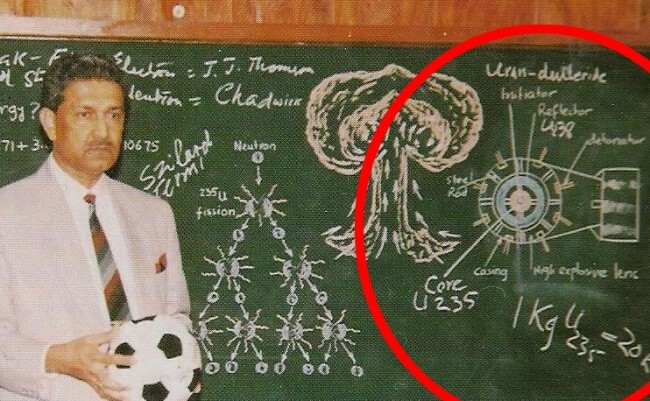 An illustration of a neutron initiator is circled in red.